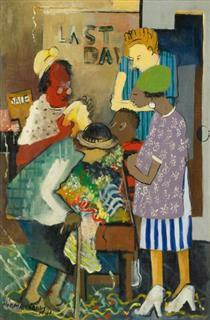 Norman Wilfred Lewis was born in Harlem, New York to Bermudian parents. Always interested in art, he had amassed a large art history library by the time he was a young man. A lifelong resident of Harlem, he also traveled extensively during the two years that he worked on ocean freighters. An important early influence was the sculptor and teacher Augusta Savage, who provided him with open studio space at her Harlem Community Art Center. 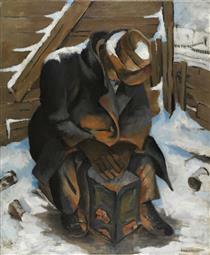 He also participated in WPA art projects, alongside Jackson Pollock, among others. He also painted social realism, painting with "an overtly figurative style, depicting bread lines, evictions, and police brutality." Lewis said he struggled to express social conflict in his art, but in his later years, focused on the inherently aesthetic. "The goal of the artist must be aesthetic development," he told art historian Kellie Jones, "and in a universal sense, to make in his own way some contribution to culture. 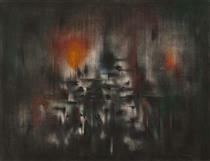 Norman Lewis was the only African- American artist among the first generation of Abstract Expressionists. 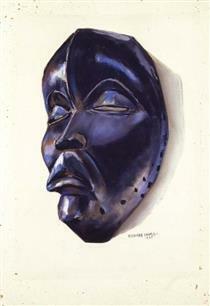 As was expressed in the segment about him on the March 20, 2016 television show "Sunday Morning" (http://www.cbsnews.com/news/reappraising-the-art-of-norman-lewis/), his work was overlooked by both White and African-American art dealers and gallery owners. He did not fit into either category perfectly. As was recently noted in a catalogue accompanying a major retrospective of Lewis's paintings this omission seem clear enough. 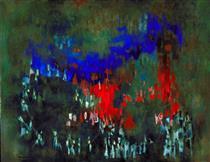 His work was overlooked many times because of his political involvement, and also because of the area where he lived. His skin colour at this time period had a major impact on his work life. Norman Wilfred Lewis was born in New York, New York. Always interested in art, he had amassed a large art history library by the time he was a young man. A lifelong resident of Harlem, he also traveled extensively during the two years that he worked on ocean freighters. An important early influence was the sculptor and teacher Augusta Savage, who provided him with open studio space at her Harlem Community Art Center. 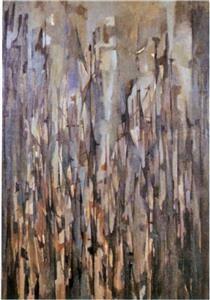 He also participated in Works Progress Administration art projects alongside Jackson Pollock, among others. 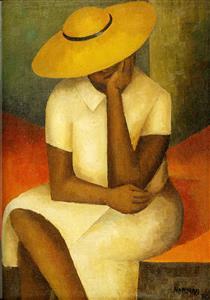 Lewis began his career in 1930, with earlier mostly figurative work. 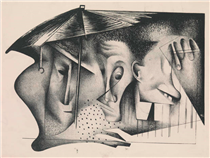 He at first painted what he saw, which ranged from Meeting Place (1930), a swap meet scene, and The Yellow Hat (1936), a formal Cubist painting, to Dispossessed (1940), an eviction scene, and Jazz Musicians (1948), a visual depiction of the bebop that was being played in Harlem. Lewis said he struggled to express social conflict in his art, but in his later years, focused on the inherently aesthetic. "The goal of the artist must be aesthetic development," he told art historian Kellie Jones, "and in a universal sense, to make in his own way some contribution to culture." 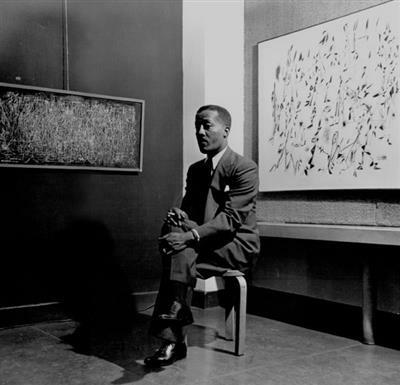 Norman Lewis was the only African- American artist among the first generation of abstract expressionists; his work was overlooked by both White and African-American art dealers and gallery owners. He did not fit into either category perfectly. As was recently noted in a catalogue accompanying a major retrospective of Lewis's paintings this omission seem clear enough. 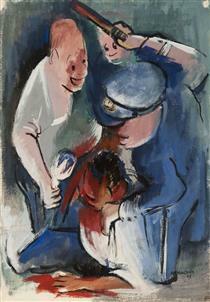 His work was overlooked many times because of his political involvement, and also because of the area where he lived. His skin colour at this time period had a major impact on his work life. 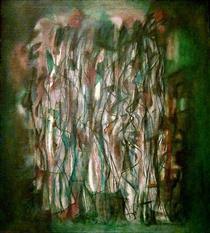 In the late 1940s, his work became increasingly abstract. His total engagement with abstract expressionism was due partially to his disillusionment with America after his wartime experiences in World War II. It seemed extremely hypocritical that America was fighting "against an enemy whose master race ideology was echoed at home by the fact of a segregated armed forces." Seeing that art does not have the power to change the political state that society was in, he decided that people should develop their aesthetic skills more, instead of focusing on political art. 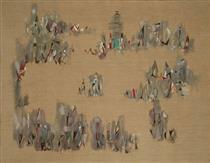 Tenement I (1952), Harlem Turns White (1955), and Night Walker No. 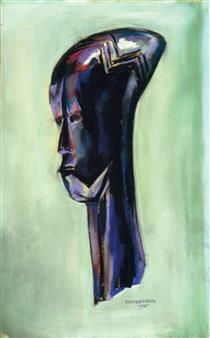 2 (1956) are all examples of his style. 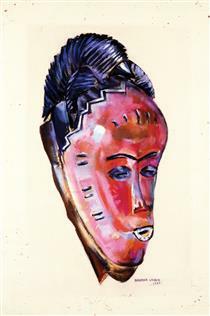 Twilight Sounds (1947) and Jazz Band (1948) are examples of his interest in conveying music. 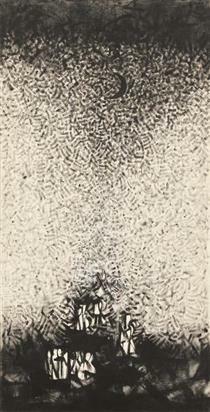 One of his best known paintings, Migrating Birds (1954), won the Popular Prize at the Carnegie Museum's 1955 Carnegie International Exhibition, the New York Herald-Tribune calling the painting "one of the most significant of all events of the 1955 art year." His signature style in those decades included repetitive ideographic or hieroglyphic elements that allowed Lewis to incorporate narrative sequences into his paintings.